I see “Yukon Gold” potatoes listed on menus and in food magazine recipes all the time now, does Idaho grow any of this variety and why has it become so popular? So, the answer is that Idaho did not invent the Yukon Gold variety. This potato, as well as several others, including Yukon Gem Milva (bright yellow flesh), Yellow Finn (one of the oldest yellow flesh potatoes known outside of South America where potatoes began), and the proprietary Klondike Goldust™ (marketed by Potandon/Green Giant) are now successfully grown in Idaho. While known for our russets, the Idaho climate produces a little drier (higher solids) yellow potato, often favored by chefs and restaurant owners. 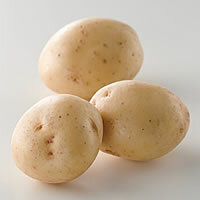 Click here for a list of shippers that carry the yellow flesh varieties or go to our page featuring the varieties of potatoes now grown in Idaho. Originally the “marketing “of the Yukon Gold was a little misleading, claiming that you don’t even have to add the butter. This was, of course false, it came about because the potato has a medium starch content (moist texture) and a yellow interior resembling a potato already buttered. The natural, moister taste and a unique flavor makes this variety good for salads, similar to red varieties. It does well with boiling. Recently chefs have tried to mash or even fry the fresh Yukon Gold variety. This can be a challenge, as the lower solids means that the potato cells will break down easier if over mixed for mashed and can turn soggy faster when frying. Over the years, manufacturers have found ways to have potato farmers grow a Yukon Gold variety with more solids or starch, and now these can be successfully promoted. Lamb Weston offers a frozen Yukon Gold variety for fries. The Arctic Circle QSR chain serves these as their only fry choice. Idahoan offers a dry potato package using Yukon Golds, which is sold in foodservice as well as in smaller packages at grocery stores. If you have not tried Yukon Gold potatoes from Idaho, pick some up and let me know what you think. Write me!